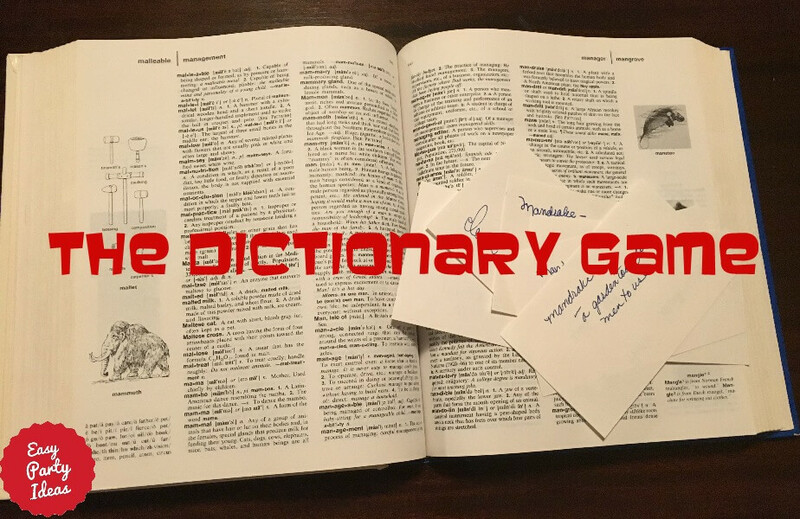 The Dictionary Game is a guessing game that is fun because it takes no advance preparation and is always a new game whenever you play it. I have a group of friends that regularly plays this whenever we get together for dinner at someone's house, and we always have a lot of laughs! To determine what the actual definition of a word is out of many choices. And the choices can get really funny! The leader of the game will select an odd, unusual word from the dictionary. The goal is to select a word that no one has ever heard of before, and that the meaning would be really hard to guess. Each player writes down the word and then writes down a fake definition for it, puts their name on the piece of paper and passes it to the leader. Meanwhile, the leader writes down the word and the correct definition on a piece of paper. Next, the leader reads all the definitions out loud (the fakes ones and the real one). Have the players vote on which one they think is the real definition. Players get one point for every definition that they guess correctly. If no one guesses correctly, the leader gets a point. Play until each person has had a chance to be the leader. After everyone has had a turn, the person who has scored the most points wins! It isn't necessary to award a prize, but if you wish to give one, a small pocket dictionary might be fun. Actually, the person who needs that prize the most is probably the person who has the least points! This Dictionary Game works great for a dinner party or other small, quiet gatherings of friends and small adult parties. We have played this game with groups of 8 - 10 people and it has worked out really well for that size of group and been a lot of fun! Catch Phrase (or one of the other fun games we've listed) is a great game to play with a large crowd! Printable Party Games - EASY!